I have a lot of ribbon from work I've done. Once in awhile I use a bit to tie up a package, but I want to keep some of each design as a sample. Currently they're all stuffed in an ice bucket which is getting pretty full. I saw this photo from All People Quilt, shared on Pinterest by Jennifer Davis. Store ribbon in soda straw dispensers? I like it. Great, as soon as I learn what that is, I'll look into it. It sounds fancy. In fact, I could for a cup of cafeteire right now. Preferably french roast. Genius idea! Not only keeps things organized, but nicely displays the ribbons, too! The whole stack lifts out, right? So I could just unwind some without taking all the rolls off. Mostly it would just be storage. Such a fab and easy idea! Thanks for sharing! So pretty! And practical! Two of my favorite things. :-) I store mine rolled around old paper towel cores in a pretty box from IKEA, but this is much nicer. And you can see exactly what you have without digging through layer after layer. Now THAT's what I call beautiful storage. I'm a little embarrassed to admit that I've been using timber toilet roll holders, it looks like I need to do some shopping! Wouldn't this work great for washi tape, too? I love it! Wowza! One of those "repurposing" ideas that is just perfect. great idea! I have a million ribbons! now I know what to do with them. How adorable and so convenient. Thanks for a great idea! This is a cute idea!! I was searching for something to store my ribbon in and I ended up using an old spice container...one of those round units with all of the little bottles in it! That's a fabulous idea and so decorative! When I first saw the photo I thought they were those canisters in docter's offices that hold cotton swabs and stuff. Silly me, but I could definitely use some for trims. 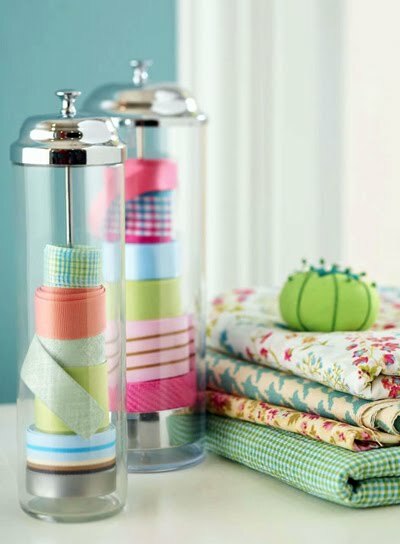 What a pretty way to store your ribbon! I recently saw a glass sugar dispenser used to store a spool of bakers twine, with the string coming out of the hole at the top. Both ideas are ingenious! Thanks for sharing! What a beautiful way to store ribbons! Right now I have a dry cleaner hanger with tiers of paper tubes as my ribbon rack. As I collect more and more ribbon, I start a new tier by tying thin rope to either corners of the hanger and stabilize using a paper tube (the ones off dry cleaner hangers). If you can picture it, you know how much of a mess that is! Oh wow. I don't think I'd use it for ribbon, I have one of those 5 rung pants hangers for my ribbon but my washi tapes would be great in something like that!!! What an awesome idea. Thanks for sharing. Love this! It's seriously the best idea I've seen yet. LOVE those ribbon containers!! Looks just lovely. fabulous idea to keep the remaining lengths of ribbon handy & accessible. love the display worthy appeal. That is an amazing idea! Not only will your ribbons stay untangled, they will also be displayed beautifully if you get the transparent glass/plastic soda straw storage. An excellent storage idea that is not only creative but very useful too. It is great for the kids' craftsroom either at home or in schools.